RipenApps added another feather in his cap, In the recent release of 2019 research by GoodFirms RipenApps secured a position in Top 3 mobile app development company in Germany. As name portrays- GoodFirms is a trusted research and review platform that helps app development services seekers to dig out the best mobile app development company. GoodFirms is a full-fledged research and review platform that helps software buyers and service seekers to opt for the best software or firm. The Goodfirms pioneering research process is meant to help service seekers identify appropriate companies that can meet their business requirements. With the one-of-its-kind research process, that comprises of three vital evaluation criteria viz. Quality, Reliability, and Ability, they have successfully simplified the activity for service seekers. RipenApps is constantly evolving as a renowned app development company providing user-centric designing and development services. We leverage an agile process that reduces risk and gives our customers predictable project velocity. We work with our clients to create compelling mobile experiences that their users love. It has been observed that with the frequent enhancements in technology that in parallel raising customer expectations to solve their problem through it, challenging app development companies to meet the prerequisites & fulfill the customers. 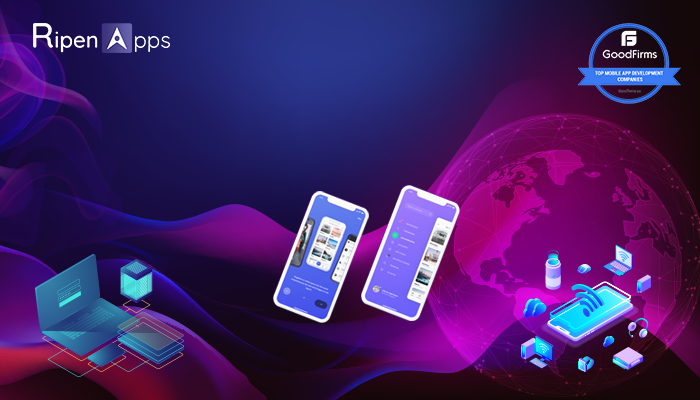 RipenApps, a leading mobile app development company can concoct highly gainful & front-line custom mobile app development that meet the precise needs of the client. What made GoodFirms rank RipenApps in the list of top mobile app development companies? Vast Experience, Excellent Quality, Gratifying Reliability, and Staggering Ability made GoodFirms rank RipenApps in the list of top mobile app Development Company. RipenApps is of the leading mobile app development companies that excel in crafting awesomeness in a wide range of mobile solutions serving distinct industries. RipenApps is headquartered in India, with the presence in USA, UAE, Germany & Canada. Merci is an incredible lifestyle application with more than 2000 or two for one offer across Restaurants, Bars, Coffee Shops and Nightclubs. Now with Merci, everyone able to Grab the offers & have an incredible experience with the food, Nightlife, or a coffee by finding yourself through GPS and benefit the appealing offers and discounts nearby. The application is available to be downloaded on iOS and Android. After purchasing a subscription, you can use your phone at the outlet to redeem your offers. A flexible solution to find a certified service provider for your car wash is nothing else but GoGreen. Avail hassle free services at your Doorstep, enjoy seasonable offers, packages, and get ready to feel the regal of your CAR as new as always. Now, there is no need to spend hours finding the best and least charged services for your car wash, just by selecting a suitable package from GoGreen and enjoy friendly services. Service Provider can register themselves with their certified documents and make money in spite of waiting for customers. Baranoy is a mind twister & booster. Get your brain exercised with Baranoy where several categories are available that throws number of questions on you and you have to find the right one. If, you have a high surety for the correct than you are left to choose the highest bid available there to increase your point which you will be able to redeem in your next quiz. There are different levels available to train your brain to work faster. Navigate online dating like ballgame with XOC. Now matching, chatting & Dating become a bit easier with XOC. A dating app that let you feel the essence of love, affection & strong tie around you. To catch up, Just tap through the profiles you’re interested in, chat online with your matches, then step away from your phone, meet up in the real world and spark something new. Get current emerging activities on your fingertips with Newscode. E-books are becoming popular; nothing compares to reading a tome curled up on a couch in a quiet corner of the house. Nowadays many more people unable to fetch time to have a look over the situations happening around even if they have an interest they won’t as they have a lack of time. We came up with a solution and created a personal reading room gives one a designated place to store, organize and display the tomes lovingly collected over the weeks. While setting up favorite news is relatively an easy task. We may surf through different categories and if you want it, more precise you will be able to set the Location and fetch the activities going around you in various groups. Menos online food ordering app, which overture nearby ready to – eat meals from various cuisines, gourmets that keep up the August of the food. Taste the Lavish dishes, dessert, soup, pie, drinks and many more eatables with the pocket – friendly budget by applying Coupon Codes. Sustain your most excellent tastes within the application so that you may grab it once again when you feel like. Track your order at every phase with the contact details. Menos for Service Providers and the delivery person benefits them to seek a detailed description of the Order Placed. To be featured on GoodFirm’s platform, we were extensively evaluated based on our market presence in the mobile app development industry. Our existence consists of our clientele, portfolio, and projects we have completed. To get your app idea converted into a full-fledged app that becomes the app store’s hot seller, get your all query resolved at sales@ripenapps.com.